Changes in water supply pressure usually don't affect the operation of a conventional toilet, although low pressure may create long wait times between flushes. Water pressure really does matter when you push the flush handle, though. An efficient flush depends on a large volume of water moving quickly from the tank to the bowl. It's the speed of flow, as well as the water volume, that creates the suction in the waste pipe that empties the bowl. When a toilet won't flush all the way, the fault is almost always in the internal mechanisms of the toilet, with one exception. A pressure-assist flush mechanism won't work properly if the supply pressure is too low. When it comes to conventional flush valves, though, you can solve most problems by making a few simple adjustments or doing some deep cleaning. What's Happening in the Tank? Whether the toilet is filling slowly, not filling at all or flushing poorly, the place to start troubleshooting is inside the tank. If water is dribbling from the fill valve instead of flowing out in a steady stream, you may be able to increase the pressure by adjusting the valve. Open the screw on top by turning it counterclockwise with a screwdriver. If that has no effect, turn off the water, disconnect the supply tube from the tank (after flushing and sponging out the remaining water) and point the tube into a bucket while you turn the water back on. If the water pressure is lower than it should be, the problem could be corroded pipes or some other problem for a plumber to address. If the toilet water pressure is good, the fill valve is the problem. Replace it. New fill valves are inexpensive, and they are easy to install. The place to begin troubleshooting slow flushing problems is also inside the tank. Start by checking the water level. If it's too low, there probably isn't enough water for a flush. Increase the level to within an inch of the overflow tube opening by adjusting the float. Next, check and adjust the chain connecting the flapper to the flush handle. If it's too long, the flapper won't rise all the way and allow water to drain quickly. Shorten it, but not too much, or it won't seat completely and it will leak. 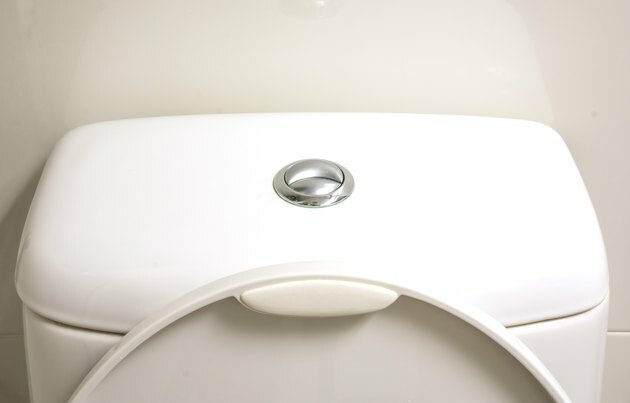 If you can't improve the flush by making adjustments in the tank, the toilet probably has blockages in the siphon jets around the rim of the bowl. You can usually improve toilet water pressure these by poking a length of 14-gauge wire into each one of these jets. Another way to clean the jets is to cover them with duct tape, pour a quart of vinegar into the tank, let the tank fill with water and then flush. The vinegar/water mixture will collect inside the jets and dissolve the scale that is blocking them. A pressure-assist flush mechanism consists of a tank that is partially filled with air, and this tank will fill only if the supply pressure is high enough. If the tank doesn't fill, there won't be enough water for a flush. When this type of toilet fails, it's usually because of a problem with the plumbing pipes or the water pressure coming into the house. If you get your water from a well, check the gauge on the pressure tank. If the water comes from a municipal system, try adjusting the pressure regulator at the point of entry to the house. No luck? Sounds like it's time to consult a plumber. Can I Flush My Refrigerator Water Lines?